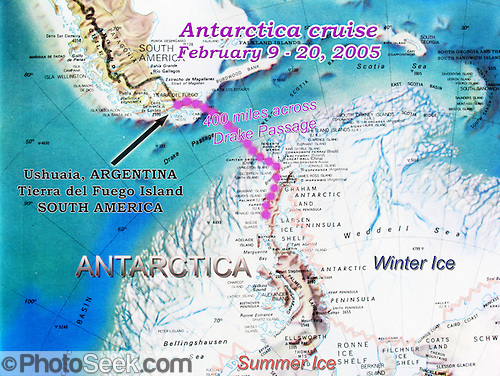 From Ushuaia, Argentina, we cruised 12 days to Antarctica, through Beagle Channel and across the treacherous 400-mile Drake Passage, February 9-20, 2005. My father, my wife, a friend and I explored the frozen Antarctic Peninsula for 6 of the 12 days. Our voyage on the good ship Explorer was run by the excellent value tour company now called G Adventures (formerly GAP). We left winter in Seattle to enjoy summer in Buenos Aires, Patagonia (in Argentina & Chile), and Antarctica from February 3 to March 11, 2005. Don’t approach penguins closer than 15 feet, according to Antarctic tourism rules. But if you lie down on the ground more than 15 feet away, curious Gentoo penguin chicks will often walk over to inspect you closely. For best photography of wildlife and icebergs, get a telephoto lens 300mm or longer (≥450mm in terms of full frame) with optical image stabilization. Bring a good DSLR or mirrorless camera with 11x (or greater) zoom lens as described in the BUY>CAMERAS menu. Find a cruise ship with the fewest passengers (90-130) to increase your land excursion time. Only 100 people per ship are allowed on land at a given time. The shortest Antarctic Cruise is 10 days, and we went for 12 days. If affordable, extend your cruise (to 22 days) to spectacular South Georgia Island to see vast colonies of Emperor Penguins. Don’t forget a prescription medicine patch to prevent motion sickness on the rough Drake Passage (5 days round trip on treacherous seas)! We were very, very sick for a solid 24 hours until staggering around to find someone on board who was willing to give us the patch cure, which you simply attach to your neck. Just two and a half years after our successful trip on the M/S Explorer, the ship sank! In telling this harrowing story in November 2007, Reuters News Pictures Service published three of my M/S Explorer images from 2005. The Explorer, owned by Canadian travel company G.A.P. Adventures (renamed to G Adventures in 2011), took on water after hitting ice at 12:24 a.m. EST on Friday November 23, 2007. 154 passengers and crew climbed into lifeboats and drifted some six hours in calm waters. A Norwegian passenger boat picked them up and took them to Chile’s Antarctic Eduardo Frei base. There they were fed, clothed, checked by a doctor, and later flown to Punta Arenas, Chile. The ship sank hours after the passengers and crew were evacuated. Since the industrial revolution began, humans have increased atmospheric carbon dioxide concentration by 35% through burning of fossil fuels, deforesting land, and grazing livestock. The world’s climate scientists agree that human-caused carbon-compound gas emissions are accelerating global warming, rapidly melting glaciers, and raising ocean levels worldwide. Humans have forced a grand warming experiment affecting all life on earth, with unknown consequences. Sea level is currently rising by 1.3 inches (3.2 centimeters) per decade. Since the industrial revolution began, excess carbon dioxide in the atmosphere from humans has acidified the oceans by almost 30%, with possibly drastic affects on shellfish and fisheries (from pH 8.25 to 8.14 in the period from 1751 to 2004 according to Jacobson, 2005). Climate change may be most dire for subsistence farming societies in Africa and Asia. Industrial nations are challenged to replace fossil fuels with energy sources that don’t increase atmospheric greenhouse gases. Other than hydroelectric, solar, wind, and other renewable energy sources plus energy conservation, few viable alternatives currently exist to replace growing industrial addiction to oil and coal. Nuclear energy has serious problems of safety and long-term storage of radioactive waste. Japan’s tragic 2011 Tohoku earthquake and tsunami caused expensive nuclear plant meltdowns, forcing long-term evacuations of hundreds of thousands of residents. Humans must reduce global demands upon earth’s resources to sustainable levels before consequences become dire. One of our highest priorities should be worldwide family planning to stabilize earth’s human population in a better balance with nature. Global warming is measurably highest in the Northern Hemisphere (which has the most land mass) and on the Antarctic Peninsula. The Antarctic Peninsula is a relatively small but climatically important piece of the continent of Antarctica which juts into the westward path of the strongest and fastest of all ocean currents, the Antarctic Circumpolar Current (ACC). A study published 2009 in the journal Nature reported that the annual temperature for West Antarctica has warmed by about 1 degree Fahrenheit in the past 50 years (to about 50 degrees below zero) and has exceeded the slight cooling measured in East Antarctica (says lead author Eric Steig of the University of Washington, Seattle). Suggested reading: National Geographic Magazine August 2007. Read more about global warming, climate change, and lifestyle sustainability.